We are all familiar with the slogan “Blood saves lives”, whether we are blood donors or not. We have seen it in hospitals, GP’s offices, magazines. Yet, there are still people, I would like to think not many, that think giving blood is only to be done when there is a pressing need, such as a family member having a surgery, or after a serious accident. “Blood Saves Lives. Safe Blood Starts with Me” was the slogan for the World Health Day in 2000. Four years later, though, in 2004, the World Health Organization (WHO) has set up a special day, World Blood Donor Day, celebrated every year on 14th of June, “to promote voluntary non-remunerated blood donation and encourage new generations of voluntary blood donors to maintain supplies of the safest blood possible and save lives”. Because blood is needed everyday even though we have no idea about it. Each year the launch of the global event is hosted by another WHO region. This year the event is hosted in Colombo, Sri Lanka (WHO SEARO) and the focus of the campaign is ‘Safe blood for saving mothers’. WHO states on its website “Every day, about 800 women die from pregnancy or childbirth-related complications. More than half of these deaths occur in sub-Saharan Africa and almost one third in South Asia. The risk of maternal mortality is highest for adolescent girls under 15 years of age”. And continues, “due to medical progress and health systems strengthening, there is substantial progress in this direction in the European Region. Acute needs for blood in obstetric care appear where preventive care is weak and health care systems require strengthening. Blood supplies need to maintain a steady level, to respond at all times to emergency situations that could be generated by accidents, acute conditions or needs for chronic supportive transfusion therapy”. A blood transfusion is often performed to replace blood that has been lost due to severe bleeding or for the treatment of severe anaemia. A pregnant woman may need a blood transfusion either because she is severely anaemic or due to emergency situations, like an ectopic pregnancy early in pregnancy (the pregnancy is growing outside the uterus) or a miscarriage, haemorrhage after 24 weeks of pregnancy (antepartum haemorrhage), during birth (intrapartum haemorrhage) or immediately after birth (postpartum haemorrhage). According to the Royal College of Obstetricians and Gynaecologists, in the UK, obstetric haemorrhage remains a major cause of maternal mortality and it is estimated that there are more than 4000 cases of severe haemorrhage each year in the UK. The majority of these cases will need blood transfusion. The truth is that women walking around pushing prams and holding their babies make childbearing seem easy. Nobody would ever think that this woman might have faced some serious complications before, during or after the birth of her child. I remember the first thing they taught us at my Masters degree was “that for a woman to get pregnant and give birth to a healthy baby is the most difficult thing in nature”. And of course as the lessons progressed I realised exactly why they emphasized on that. The things that need to take place for a woman to conceive are numerous, the egg needs to be mature enough and the right place at the right time, the cervix needs to be thick enough, the sperm needs to travel quick enough, the best of all (or luckier, you pick) should be able to enter and so on and so forth. A healthy baby is the result of intense, yet super-delicate tuning within the woman’s body. If you think about it, a “foreign” organism is growing inside a woman and her body does not mind. Getting pregnant is a true miracle but it is also a real burden for the woman body and overall health. We should never take it for granted and we should always treat a pregnant woman, no matter how good her pregnancy is, with great care as the complications she may face at any time during her pregnancy can cost her life and/or that of her unborn child. All these signs if left untreated they might have detrimental consequences for the unborn child and the mother. A pregnant woman’s body changes so rapidly that it’s difficult to determine whether what she is feeling is normal or not. Ask your practitioner to review with you, as your pregnancy progresses, which signs warrant an urgent call or immediate emergency medical care. You can never know when blood might be necessary to save the mother and/or the child. An emergency cesarean might be necessary, for example, among other things, if something goes wrong. As we say in my circle of work “you can never be sure about the outcome of a pregnancy until the baby is born”. 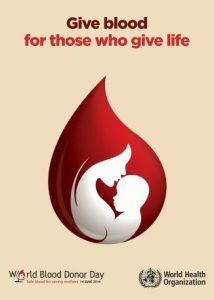 Give blood, a mother and her child might need it. Give blood, more than one person can benefit from it. Give blood, it takes only 10 minutes of your time but can give many years of happiness to another. If you’re not sure whether a symptom you are having is serious, if you don’t feel like yourself, or you’re uneasy, trust your instincts and call your practitioner/caregiver. Do not feel ashamed or intimidated. If there’s a problem, you’ll get help right away. If nothing’s wrong, you’ll be reassured. A warning sign might just be a false alarm BUT you should never take the risk. And if you can’t reach them on the phone, you can always go to the hospital (to labor and delivery) or the emergency room. Just don’t stay at home wondering about it.